If you could describe 2018 design trends in just one word it would be BOLD. Every year brings new ideas and new design styles. 2018 is exceptionally different because we’re seeing the past years of neutral walls, neutral furniture, neutral everything take a back set while we see boldness take over. 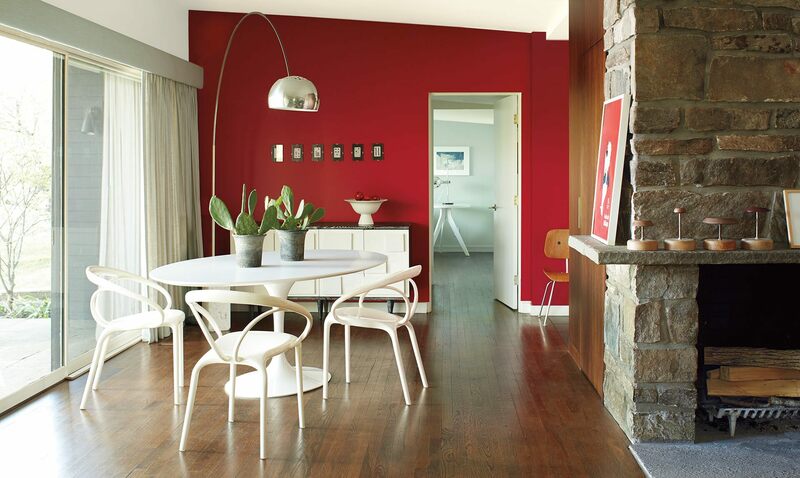 Everything from bold colorful kitchens, to extra bold furniture and strong bold paint color choices. Good bye plain gray or plain white kitchens. Hello white & blue kitchens, green kitchens, real wood kitchens and YES even black kitchens! Two toned kitchens are becoming very popular for 2018. Islands are getting special treatment and are being treated like furniture quite often being a different color than the rest of the kitchen. 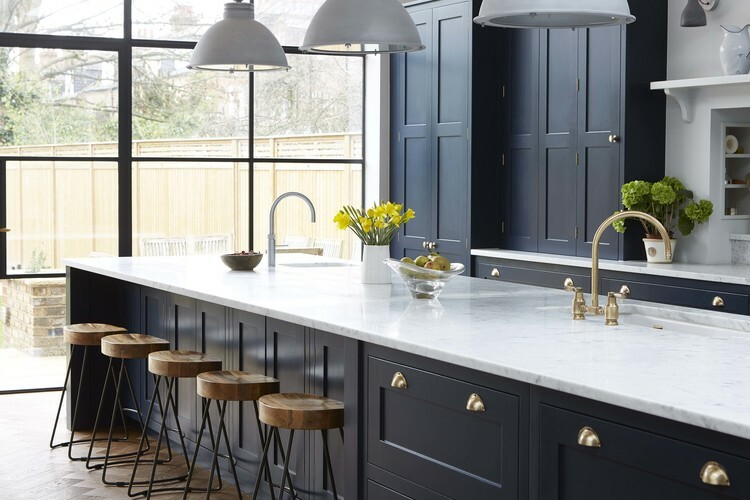 The most popular two toned kitchen is currently white and some shade of blue. Another trend you will see this year in kitchensis REAL wood kitchens. Not the fake cheap builder grade wood-like kitchens of the past but real wood typically in a mid-tone. Surprisingly, green kitchens are becoming very popular for 2018. 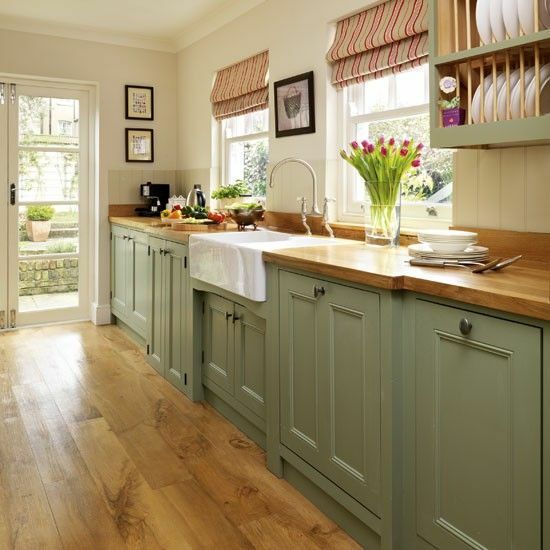 This green kitchen above is a DIY painted green kitchen cabinets. The color complements the wood counter and floors beautifully. Dark and even solid black cabinets are trending this year. A dark kitchen may be fun at first, but homeowners may tire of this trend quickly. It will be interesting to see how long this one lasts. Good bye cream and gray furniture! 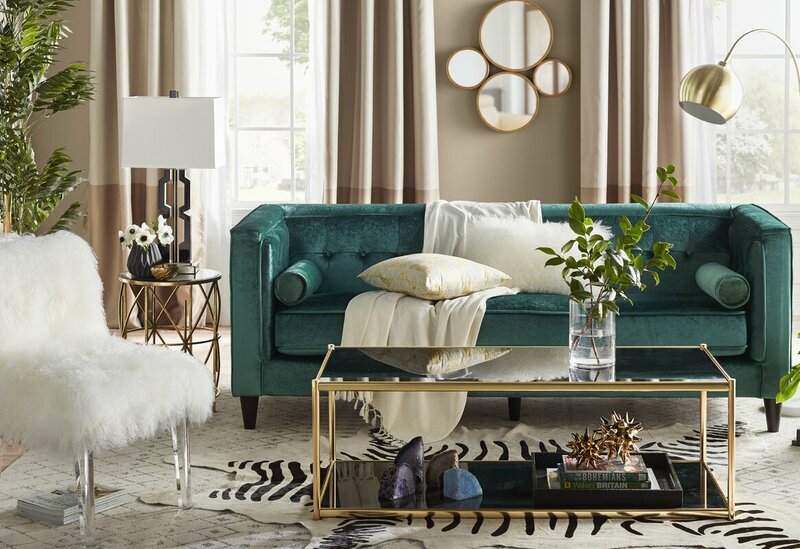 Bold couches, accent chairs is a new thing. The bolder the better. Green couches are hot this year – who knew??? If a big bold couch is too much for you, accent chairs in a different color are a nice way of getting a bold pop of color without over committing like a couch. Blush Pink is hitting the design world by storm this year. It’s taking its normal spot in almost every girl’s room but its also making a statement in living rooms and other areas in the home. Some like it in small doses such as decorative cushions and accents, whereas the more brave will actually paint their walls with this adorable color or even purchase furniture in this shade. For the past couple of years, the paint companies have been gently pushing us out of our comfort zone moving us away from our neutral grays and neutral beiges. This year they weren’t so subtle. They shoved us out of the nest with Pantone announcing Ultra-Violet as their Color of the Year and Benjamine Moore announcing Caliente as their 2018 Color of the Year. As beautiful as they bold rooms are, an entire room might be too much. A beautiful bold accent wall in a kitchen, dining room or kitchen would be a great addition to a room, or a bold powder room is always fun when you walk into this space and get a surprise. 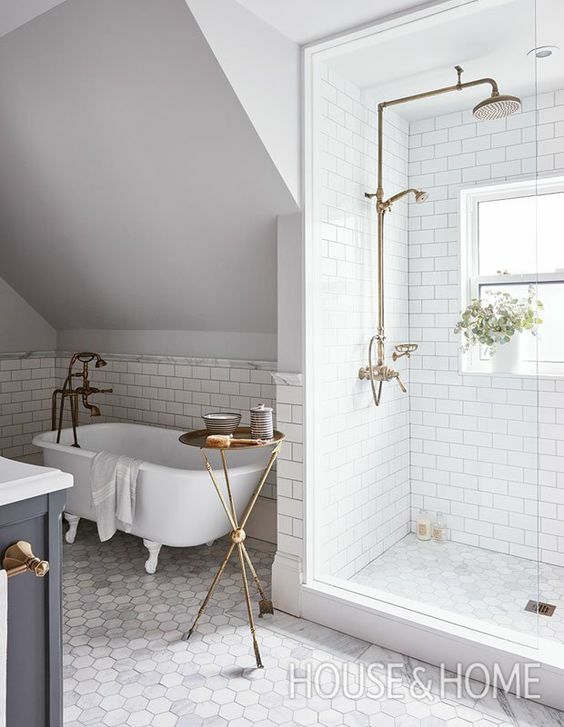 Source: Unknown – who designed this stunning bathroom? An accent wall is a nice way of adding a bold pop of color without the total commitment of a bold room. 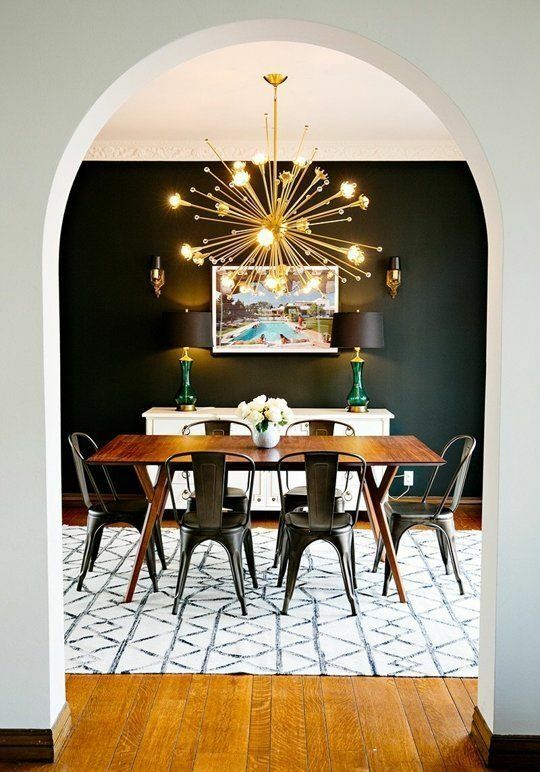 Dark navy and black are also other bold colors that you will see adorn walls this year. This texture trend that started last year is continuing into 2018. If you don’t want to go for the bold colored couches to make a statement, adding textures, mixing up textures and layering is a fun and relatively inexpensive way to turn a plain neutral colored sofa or a chair into a bold and interesting statement. 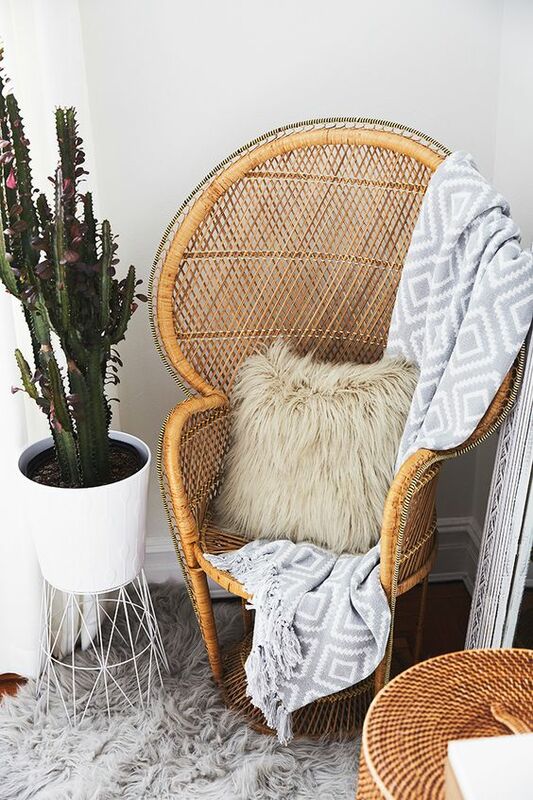 Don’t be afraid to add lots of different kinds of textured cushions, layer a rug, throw in some tall interesting plants, and don’t forget the throws. These spaces show that adding lots of different textures, layering rugs, interesting curtains, wood furniture accents is eye candy for the eye making a regular ho-hum space very inviting. Some people have mixed feelings about brass being back in style. When they think of brass, they think of the really shiny yellow brass of before. But the brass of today is toned down, not so “yellow” and very sophisticated in style. You will see these new style of brass adorning many kitchens and bathrooms. So what 2018 trend are you going to try in your home this year?